Audrina Cardenas, a baby girl who was born with her small heart beating outside of her body, is now remarkably recovering after a revolutionary surgery saved her life. Audrina Cardenas was born with a rare congenital disease where her heart formed outside the chest; though the disease affects only one in eight million, 90% of infants with the condition are stillborn or die within days of their birth. But after hours of complicated surgery at the Texas Children’s Hospital in Houston, Audrina Cardenas is recovering, and her mother Ashley couldn’t be more thankful. 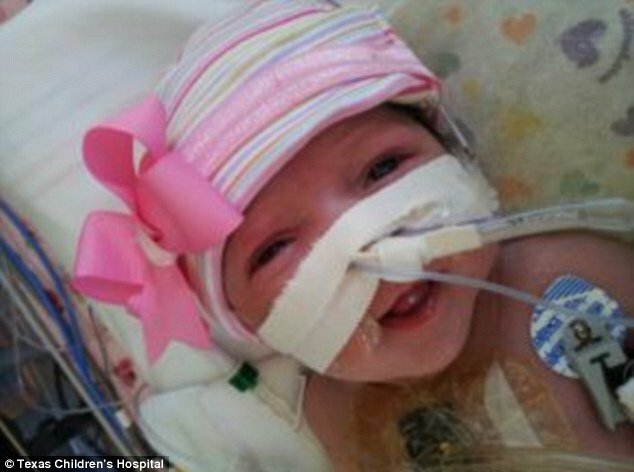 Audrina Cardenas had ectopia cordis, causing her heart to be located outside of the body. Incredible video taken during the surgery shows it beating at a steady pace. Her mother found out about her daughter’s life-threatening condition at a routine check-up at 16 weeks of pregnancy. Ashley Cardenas said she was given three options, each of them difficult in their own right – abort the baby, carry her to term knowing she would die shortly thereafter, or have doctors construct a hole in her unborn baby’s chest to make room for the heart. She told the Houston Chronicle that her choice to have her newborn daughter operated on was incredibly difficult. “You’ll never know what it feels like to make that decision until you’re faced with it,” she said. Audrina Cardenas was born five weeks ago. Ashley Cardenas calls her “my miracle baby”. But the infant isn’t in the clear yet – surgeons said that she’ll need more surgeries in coming years to repair defects in her heart. They must wait for Audrina to heal and gain strength before attempting any additional procedures. She will need to see a cardiologist for the rest of her life, but doctors said the prognosis is good. Dr. Carolyn Altman, a pediatric cardiologist at the hospital, said in a release: “Despite Audrina’s misplaced heart, she was born with no other syndromes or genetic conditions that would cause additional stress or complications on her heart.